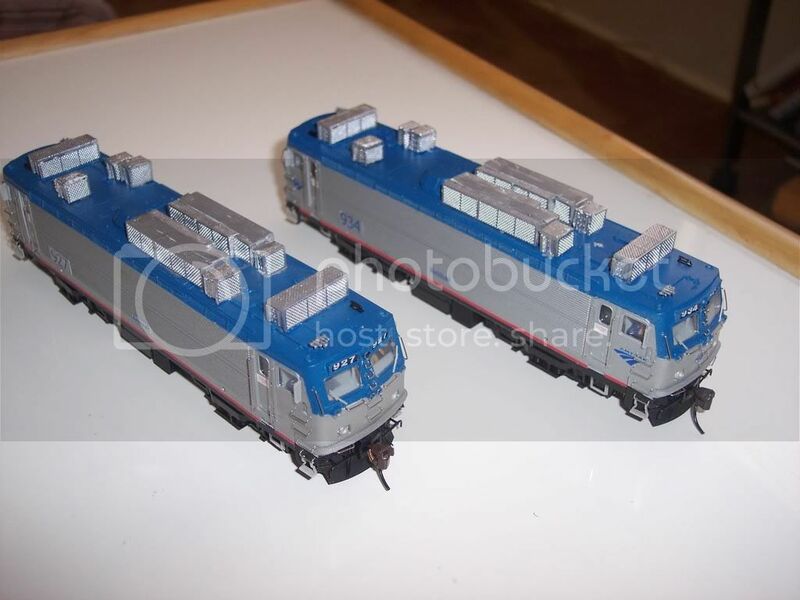 As my skills at modeling have grown as well as my standards for Amtrak models, my desire for an AEM7AC grew as well. 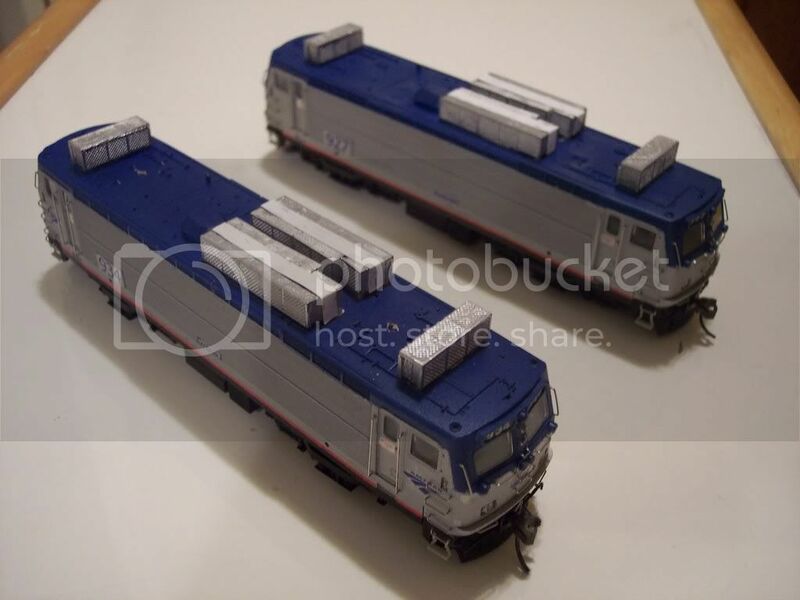 I have to attribute my starting this project to my friend and fellow Amtrak modeler, Mike Thomas. He has inspired me to take up this project after he mentioned plans of his own. In fact we are both simultaneously working on the project. He has three AEM7s waiting to be rebuilt while I have 2. After 30 years of reliable service, Amtrak wanted to overhaul its fleet of AEM7 locomotives. Between 1999 and 2002, a number of AEM7s were re-built into AEM7ACs. The "AC" stands Alternating Current and is a fairly new technology for railroads. AC propulsion motors allow locomotives to have more pulling power and better acceleration as opposed to the conventional DC locomotives. Amtrak carried out this rebuild program under the supervision of Alstom. Initially Amtrak intended to overhaul all of the existing AEM7s but due to budget problems, Amtrak had to end the program in 2002. Atlas Model Railroad Company has blessed the Amtrak modeling community with a well tooled, Northeast Corridor Electric locomotive. The AEM7. Although a number of changes were made to the prototype at the time of its release, modelers have expressed a great deal of satisfaction with the model. Many AEM7s have undergone a major overhaul and were equipped with AC traction motors and re-designated as AEM7ACs. This project is an attempt to parallel this prototypical rebuild. No model of the AEM7AC is available but a conversion is very doable but takes time and patience. 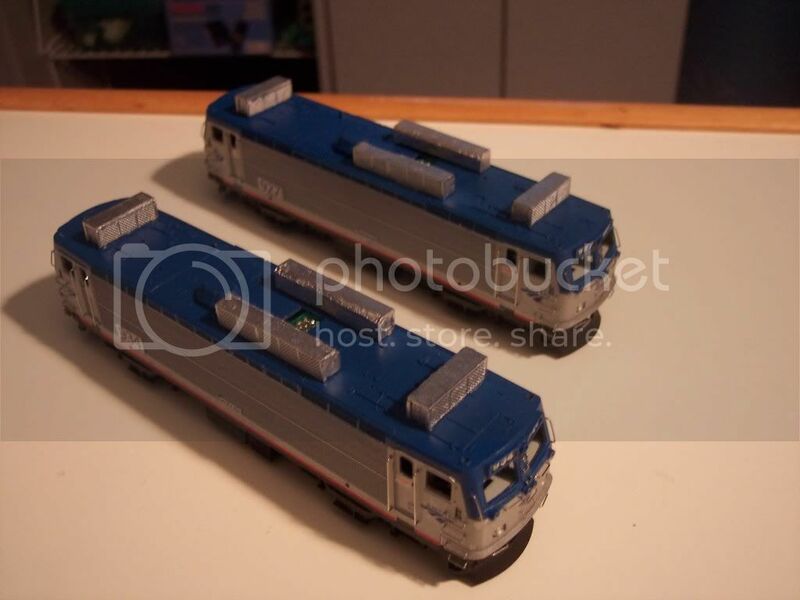 This model will not only sport the new paint scheme and have the new molds added to the roof of the model; but hopefully the locomotives will also be equipped with operating strobe lights and ditch lights. The factory model does not contain holes for ditch lights and so the holes will have to be drilled. The installation of these features will most likely take longer than the body work as I conservatively estimate that I will only have time for the body work. I will try to update this page as frequently as possible to keep viewers up to date as to the progress I'm making. Wish me luck! Thanks for your interest! If you have any questions, please contact me. This is how the undecorated Atlas AEM7 comes. All detail parts have to be applied by the modeler and this makes it convenient for me as I don't have to risk loosing or breaking pieces while stripping the ready-to-run model. This is the model after the Pantographs were removed. In addition to that, the pilots were removed as they can be worked on separately. The primary focus is body work on the shell. I filed down the rim that virtually traces the electrical box on the roof of the model. Since this no longer exists on the AEM7AC it needs to be eliminated. To remove it, I initially cut pieces off the best I could with a cutting tool. You won't be able to get it all but you should be able to cut off enough where you won't be filing for decades. We can't forget the number and marking plates on the side of the model. I was unable to get feedback for my inquiry on the thickness of the plates that Atlas used so I took a risk and looked for the thinnest possible styrene sheet I could find. It took me a while to figure out what to use for this until Mike Thomas pointed me in the right direction. I used Evergreen Scale Models' 0.005" thick sheet styrene. It is very flimsy so be careful with it when cutting it. I used one of the existing Atlas phase V AEM7ACs that I have to get the dimensions of the two different sizes of the number plate (large one) and marking plate (smaller one). This was an excellent pick because it is a perfect match to the Atlas model. To Correctly place the plates I again used the existing models I had as a reference. Finding the right place for where to drill holes for the ditch lights is probably one of the most daunting tasks. After examining a number of photos online I found a pattern that would best help me find the right location for where to drill. Looking at the photo you will see that the marker lights and drill bit holes for the hand rails found on the nose of the locomotive were used as a reference. The outside edge of the ditch light holes line up with the center of the marker lights on either side and the top edges of the ditch light holes are roughly aligned with the top of the lower hand rail located in front of the locomotive. The size of the holes are based off of Details West's ditch light kit #229. You should be fine as long as you do not drill or file past those marks. The whole should be big enough for the ditch light frame to just fit. After using the markings noted in the above step, I carefully began drilling holes for the ditch lights. I made the hole big enough so that I can fit small files to square up and smooth the edges. The files that I used were very helpful. They are made by model masters and come in three different shapes. One is four sided, another is round with a point at the tip and the third is round on one side and flat on the other. The later two were used more frequently. A somewhat tricky step is to fill in the space that will eventually exist between the molds for the AC radiator located above the cabs. Modeling putty was used. I took one of the molds I have created and based the distribution of the putty on that. I then sanded down the putty until the putty was even with the rooftop's highest point. If you look closely the roof does curve and so the roof should be "raised" in that general area (on both sides) to fill in the space. I was fortunate enough to squeeze in a paint session in the harsh cold of winter. The shell was sprayed with Testors' Metallic Silver paint. I've had the most success with using acrylic paint over enamel when I let the base enamel paint dry for a long, long time. At LEAST a week. To keep sane, one other aspect of the project you can work on is kitbashing the molds for the AC radiators. These can be crafted by using the molds provided by Atlas for the electrical box mounted on the roof. Contact Atlas' parts department for the extra parts. I had to order 5 extra boxes in addition to the ones that came with the locomotives. 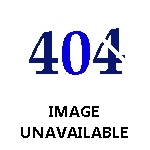 don't forget, I am doing two AEM7ACs. For one AEM7AC, you may only need about 2 or 3 extra boxes. Here's a shot of both of the models after getting painted further. An airbrush was used for the blue and black paint while the red stripes were used from Highball Graphics Decals' set P-107. To get the hue you see in the photograph I mixed my usual combination of paints for the phase IVb livery I used for my phase IVb Amfleets: Mostly Badger Railroad Paint's D&H Blue with a few drops of CSX Blue and even fewer drops of Penn Central Green. To get as close as I could get to the right color I actually used the Athearn/Walthers AMD-103's blue paint as a guide but rather than spray a surface until I was satisfied with the hue, I used the mixing stick I had and used the paint on the stick. Before applying the paint, I sprayed the shell with dull cote which proved to be a good move. The prototype's paint is a bit dull with a gloss finish. WARNING: Do not apply the number plates (made from the 0.005" thick styrene sheet) until after you are done with using the masking tape. My masking tape ripped off some of the number boards but luckily I was able to replace them with little trouble. While painting the blue roof and windshield area, The paint somehow seeped through the masking tape. Fortunately I was able to touch up the model with the application of silver paint with a brush. If you have to take this route, when complete and the red stripe decals are applied, go over the entire model again with dull cote. Also note the roof of both locomotives. If you look closely you'll see that the electrical box areas are in different positions with respect to both locomotives. That is because the A end of one locomotive is facing the camera and the B end of one locomotive is facing the camera. The locomotive up front has its B end facing the camera. You can always determine the A end of an AEM7 by looking at the location of the electrical box area (although it's tougher to determine with an AEM7AC). The Electrical box is always slightly closer to the A end. What's my point? Look a the location of the number plates. No matter what side of the locomotive you look at, the plates will always be to the left. This is a mistake anyone is liable to make. Luckily Atlas didn't make this mistake on their phase V AEM7 production. Once the decals are all applied, that is when the gloss cote will be applied. I finally installed the ditch light housings from "Details West" kit number 229. When the housings were inserted into the openings the models looked "more believable" to me. The reason why I say this is because when the initial holes were drilled they started to look too big and too close together but now they appear to match the prototype. Anyway, the step below shows how I pulled off the installation of the ditch light castings. It's tricky but then again it's not too bad. You will need some fine tweezers and a sharp eye for this step as it can be a challenge working with very small pieces. Just remember that the nose of the AEM7 is curved and the ditch lights have to face straight and forward. The trick is to glue small styrene pieces to the corners of the ditch light casting. On the outside corners, one piece of .005" styrene is needed. For the inside corners, I folded a small sheet of styrene in on itself four times. This gave the casting a good place to rest on and allowed for the casting to be pointed straight ahead. This will be one of the most tedious parts of the projects as this has to be done 32 times. 16 times with the one sheet and 16 for the 4 fold sheet, outside corners and inside corners respectively. Just remember to paint the areas that have a chance to be exposed (mainly near the corners of the castings) are painted silver prior to installation. The piece "rod" sticking out will be cut off as the cab insert with the engineer and fireman takes up a great deal of space leaving little room for the ditch light bulbs and wires. The only reason why it was left there was so that it would be easier to position the pieces in place with the tweezers. With decals applied and the models coated with a gloss lacquer, the models are now ready to have their wire grab irons installed however I have hit a snag in terms of figuring out how to install them. Apparently the pre-drilled holes are not big enough for the pieces to slide in. You can see here that I chose the numbers 934 and 927. As of now, the prototype 927 does not have the three sheets logo but eventually it will. I chose 927 because I have run into it a number of times. I chose 934 as it was the locomotive featured in a tape of a cab ride inside an AEM7 locomotive from Philadelphia to New York. The wire grab irons were installed as well which was very time consuming. Some holes may or may not have to be re-drilled due to the paint closing up the holes that otherwise provide for a perfect fit. I did not need glue as previously thought. One of the most difficult parts of the project has been tackled; the kitbashing of the AC radiators found on the roof of the AEM7AC. These were created with the use of the Electrical box part on the AEM7. Additional parts of this type were ordered from Atlas. Allot of modeling putty was used to fill in the grating on the top, back and sides of the radiators leaving only the front grating exposed. The best way to look at kitbashing these parts is to cut the electrical box in thirds. There is a partition in the middle (looking at the roof) resulting in the appearance of 6 rectangles total. You want to cut across three of them, horizontally, half way between the edge and the partition. For the side radiators, a total of five grated squares should be visible which means you will have to repeat the process but you will have to cut off one of the three sections for the second part. Make sure that the "two-square grated section" faces the cylindrical molding on the roof. This applies to both sides. For the radiators over the cab, the same process is used, minus the second part. There should be plenty of scrap pieces left over to cover up the back but try to make it as neat as possible as the radiators have exposed grating on both sides (front and back). See the photograph to get a better idea of where these radiators are to be placed. Work from step 6 should be self explanatory for where to put the radiators near the cab roof. The next step is to virtually mirror the outside of the long AC radiators on the inside of both radiators but make sure they are about 3/4ths the width of the originals so that there is space in between the two arrays. Also make sure that instead of five sets of "radiator grills" per radiator, make sure there are only four. There is a fifth one towards the "A" end but it is depressed with respect to the inside of the two radiator boxes. There will be an ugly gap between the "four-grill" inside radiator and outside radiator. This is where the styrene sheet comes into play. The prototype actually has a total of three radiators (so it appears) stacked along side one another. To simulate the center radiator (or whatever it is) take the thinnest sheet of styrene you can find (in this case I used what was left over from previous steps. There should be plenty left over) and either use this photo or prototype photos to eyeball the width. I cut a strip longer than what was actually needed and then bent the styrene strips to conform with the radiator arrangement. I also bent the strip where I would eventually cut giving me the appropriate length at which to wrap it around the radiators. You will notice in the picture that the center radiator slopes down slightly at an angle. I bypassed this step for three reasons. 1) I was sick and tired of working with putty let alone trying to find a supplier who had it on hand. 2) The putty I had dried up. 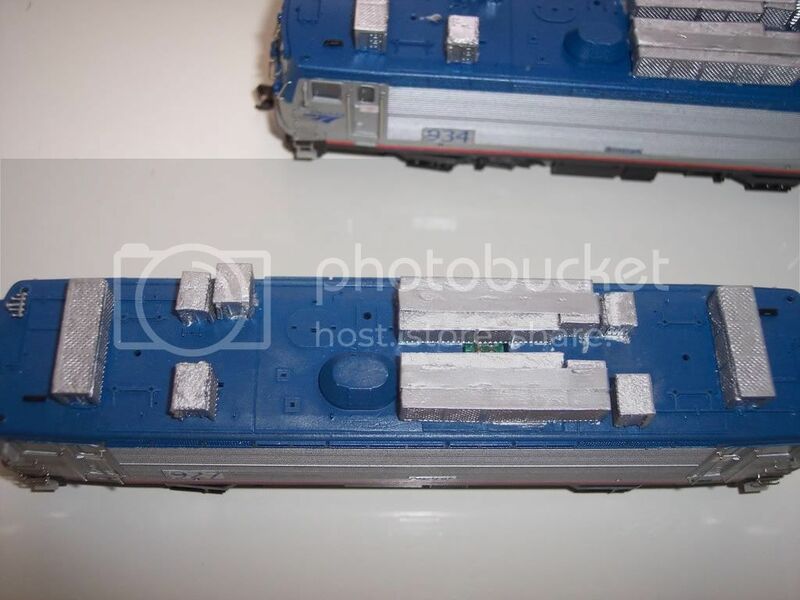 3) Even if I had the putty, it would've been to risky with regards to the paint job on the roof and/or messy. Finally! I've been procrastinating with this step for the longest time. I added the additional radiator array however; It wasn't until after I finished assembling each individual piece, and the putty dried up that I realized that I was short one radiator box per car. There should actually be six and not 5. Someone will more than likely point that out even though it has been acknowledged here but that's the nature of the beast. I also provided a close up of the roof arrangement on my model. You will notice that the opening provided by the manufacturer for the decoder is visible with the jumper plug underneath. It would've made more sense to photograph locomotive 934 where I placed electrical tape on the inside of the shell to cover up the opening. I plan to do this with 927 as well but not until I have to go under the hood again. I also installed the remaining details such as the windshield wipers, ladders on the pilots and antennas at either end. Other roof detail provided will be applied on a case by case basis. Please note that in this photo, the "A" end is located to the right.